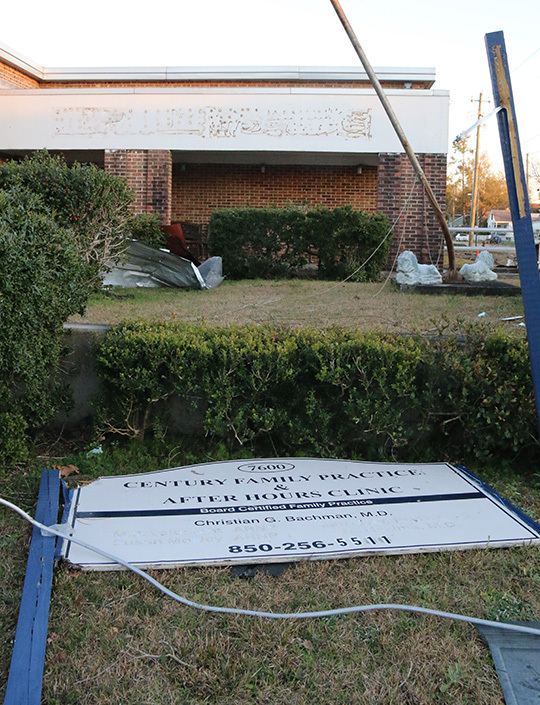 Dr. Christian Bachman finds a lot of irony in the fact that his office building in Century was deemed unsafe, but it’s the very place many Century residents ran for shelter after last week’s devastating tornado. Century’s only doctor has been embroiled in a fight with a state agency to continue his medical practice from the old Century Hospital building. In a letter dated August 26, 2015, Century Health Care Access (CHCA) and Dr. Bachman, president of CHCA and physician for Mayo Street Medical, were ordered to vacate the facility by September 30, 2015, by the Florida Department of Environmental Protection, current owners of 25,000 square foot building on Mayo Street. 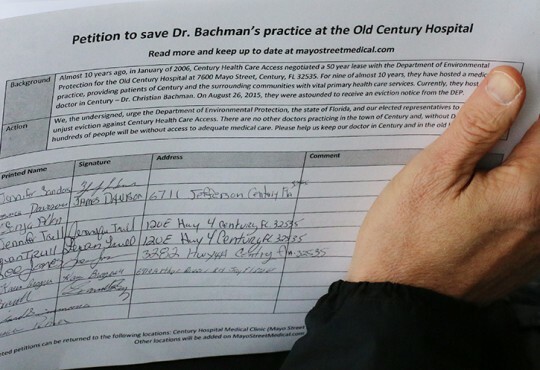 The eviction date passed, with Bachman and his medical practice receiving much media attention that began with a NorthEscambia.com story. As a result, Bachman said, DEP shifted their position, which at first seemed like a positive breakthrough. But with time, he said he’s realized it appears the DEP has simply changed their strategy to making “impossible demands”. Bachman said a subsequent letter from DEP gave his practice 60 days to fix a series of issues, some of which such as sprinkler and alarm panel inspections, were reasonable and are underway. The Florida State Fire Marshal’s Office also demanded changes that the doctor said were impracticable to impossible. Demands included repairs to large areas of ceilings that were patched by DEP or their contractors in the 1990’s to install a new fire sprinkler system. He said it was not possible to obtain the permits for the work in a short time period, much less make the costly repairs. Bachman has refused to budge, continuing to operate his medical practice, seeing patients regardless of their ability to pay and even making house calls. On Friday afternoon, February 12, 2016, law enforcement officers served Bachman a cease and desist order that demanded that no member of the public be allowed inside the building due to fire code violations. “The facility has been closed to the public by order of the State Fire Marshal’s Office. Under the Fire Marshal’s cease and desist order, no public access to the building shall occur until such time as the repairs to the critical life safety systems have been addressed to the satisfaction of the State Fire Marshal’s Office,” Lori Elliott, press secretary for the Florida Department of Environmental Protection said in an email to NorthEscambia.com..
“The terms of Dr. Bachman’s lease require him to adhere to the standards of the Florida Fire Prevention Code and the National Fire Protection Association Standards, as determined and enforced by the State Fire Marshal. Any requirements or actions by the Fire Marshal Office are separate and outside the scope of DEP’s authority, however, DEP’s responsibility and authority is to ensure compliance with applicable laws and codes and to uphold the terms of the lease,” Elliot continued. Two days after a powerful EF-3 tornado leveled much of the Century area around the old hospital, Bachman stood outside the building, pointing out the damage. 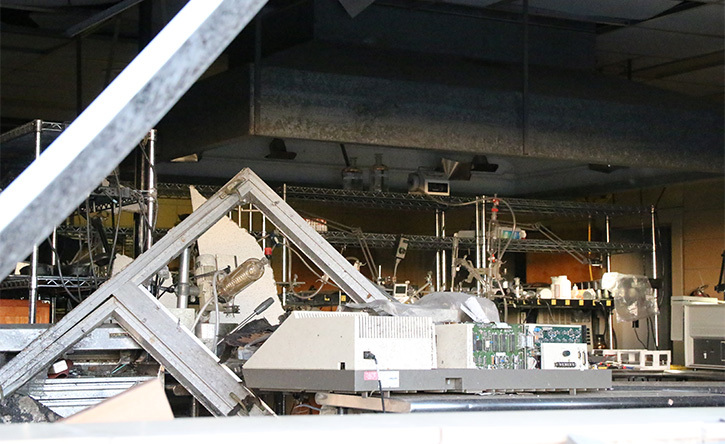 He said the building suffered roof damage and several windows were blown out, including those on his research laboratory. At that point, he said he was not sure what the next step in his fight to stay open would be. In fact, he began to question the battle. Bachman said the cease and desist order from the State Fire Marshal’s Office was served on him about 3:45 to 4:00 on that Friday afternoon, with a 72-hour provision to comply. Almost exactly to the minute 72 hours later, the most powerful tornado to hit Escambia County in 45 years roared through Century with winds over 150 mph, and wiped out numerous homes in Century around Bachman’s office. He said he ran out and immediately began looking to help anyone that was injured. When Gov. 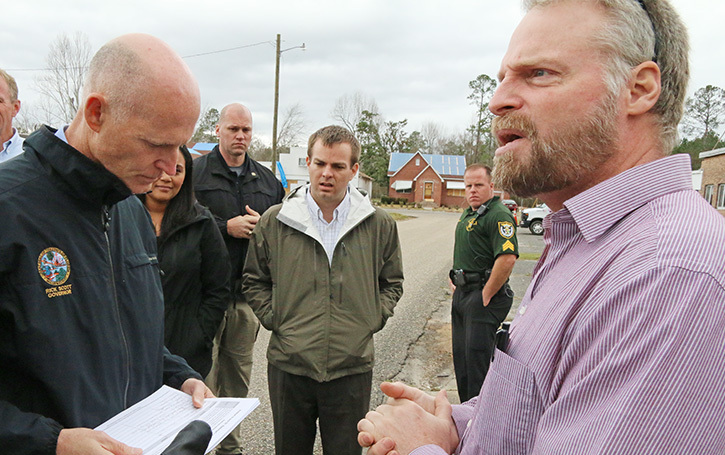 Rick Scott toured the tornado damage in Century last week, it presented Bachman with a sudden and unexpected opportunity to discuss his battles with state government face to face with the state’s top elected official. As Scott walked along Mayo and Church streets, toward the old Century Hospital, he had been briefed on the facility and Bachman’s plight. As Scott and his entourage continued to walk down Church Street, just outside the boarded-up windows of Bachman’s research lab, Bachman grabbed the chance to plead his case. Scott listened to Bachman, assuring him that he would review the situation, as he thumbed through the petition. As far Bachman’s next move…it remains a wait and see game. 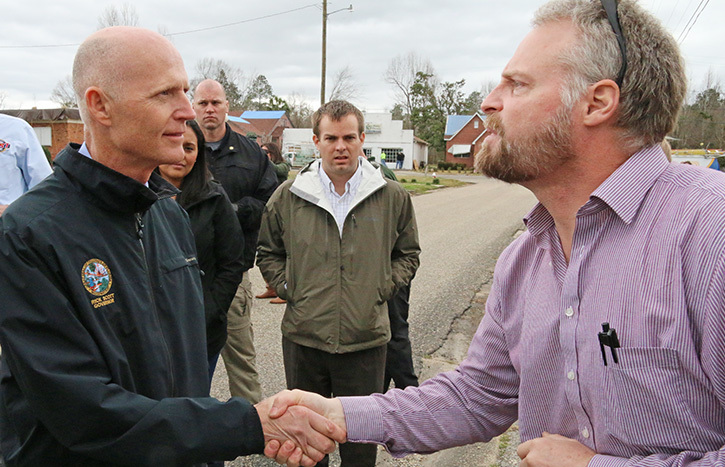 Pictured top: Dr. Christian Bachman shakes hands with Gov. Rick Scott just outside the old Century Hospital. Pictured top inset: Damage to the old Century Hospital following a tornado. 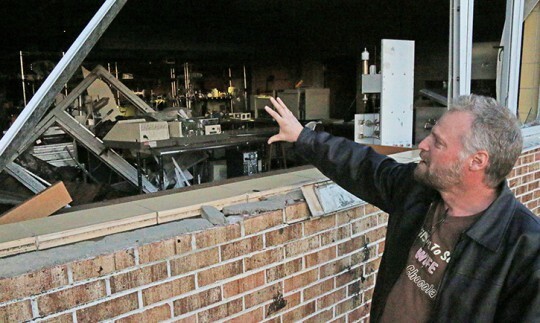 Pictured middle insets: Backman points out tornado damage which left his research laboratory without windows. Pictured bottom inset: Bachman presented a petition to Scott. Pictured bottom: Bachman’s petition in the hands of the governor. NorthEscambia.com photos, click to enlarge. An apparent drive-by shooting Sunday night in Dogwood Park, north of Molino, is under investigation by the Escambia County Sheriffs Office. A resident on Seely Road near Highway 97 reported shots-fired about 9:55 p.m. At least one bullet hole was found in the home, according to Amber Southard, ECSO spokesperson. The incident remains under investigation. Anyone with information is asked to call the Escambia County Sheriff’s Office at (850) 436-9620 or Crime Stoppers at (850) 433-STOP. A pedestrian was killed Sunday evening on Pine Forest Road. 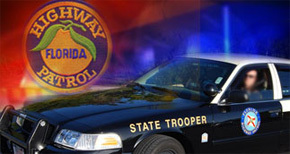 According to the Florida Highway Patrol, 38-year old Timothy W. Thornton of Pensacola was walking south of the shoulder of Pine Forest Road south of Five Flags Speedway when he was struck by a southbound 2010 Hyundai SUV driven by 64-year old Glenn W. Jenkins of Pensacola. Thornton was transported to Sacred Heart Hospital where he was pronounced deceased. Jenkins was not injured. According to the FHP, the exact location of the vehicle and Thornton at the time of impact remains under investigation. Monday: Partly sunny, with a high near 73. Calm wind becoming south around 5 mph in the afternoon. Monday Night: Areas of fog after midnight. Otherwise, partly cloudy, with a low around 47. South wind around 5 mph becoming calm in the evening. Tuesday: Areas of fog before 9am. Otherwise, partly sunny, with a high near 72. Light southeast wind becoming south 10 to 15 mph in the morning. Tuesday Night: A chance of showers and thunderstorms before 3am, then a slight chance of showers. Mostly cloudy, with a low around 50. South wind around 10 mph becoming northwest after midnight. Chance of precipitation is 50%. Wednesday: Mostly sunny, with a high near 63. North wind around 10 mph. Wednesday Night: Mostly clear, with a low around 41. Northwest wind around 5 mph becoming east after midnight. Thursday: A 20 percent chance of showers and thunderstorms after noon. Mostly sunny, with a high near 67. East wind 5 to 10 mph becoming southwest in the afternoon. Thursday Night: A 20 percent chance of showers and thunderstorms. Partly cloudy, with a low around 46. Southwest wind 5 to 10 mph becoming north after midnight. Convoy 4 Century rolled into Century early Sunday afternoon for the second time with relief for victims of the President’s Day F-3 tornado. 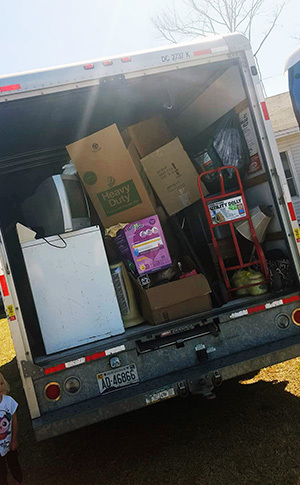 The group arrived at the damaged Wesley Chapel on Jefferson Avenue with a donated U-Haul truck and a trailer with 3,000 pounds of non-perishables, household goods and more for the Century tornado victim, all donated by people in the Pensacola area. And they also held a little fish fry for those in need. To follow the group or for donation information, visit their Facebook page. U.S. 29, Escambia County – Intermittent and alternating lane closures within the town of Century and from Champion Drive north continue. State Road (S.R.) 10A (Scenic Highway), Escambia County – East and westbound traffic reduced to one lane on Scenic Highway from 9 a.m. to 3 p.m. Monday, Feb. 29 as crews remove debris from the roadway. Traffic flaggers will be on site to safely direct traffic through the work zone. I-10 Widening, Escambia County – Alternating lane closures between Davis Highway (Exit 13) and Scenic Highway (Exit 17) from 7 p.m. to 6:30 a.m. the week of Monday, Feb. 29. as crews perform paving and storm repairs. The speed limit on I-10 between Davis Highway and Scenic Highway is reduced to 60 mph. S.R. 289 (9th Avenue), Escambia County – Crews continue paving operations between the intersection of Bayou Boulevard and Creighton Road. Paving operations will also begin Monday, Feb. 29 at Bayou Boulevard (S.R. 296) and Airport Boulevard (S.R. 750). Lane closures will be in effect from 9 p.m. to 6 a.m. Motorists will also encounter intermittent and alternating daytime lane closures between Fairfield Drive and Cervantes Street as crews adjust manholes and valves. U.S. 98 (Garden Street), Escambia County – The outside westbound lane will be closed between North Tarragona Street to North Jefferson Street 8 p.m. to 6 a.m. Tuesday, March 1 and Wednesday, March 2 as ECUA performs underground utility work. U.S. 98 (Garden Street), Escambia County – The outside westbound lane at Springs Street will be closed from 8 p.m. Thursday March 3 to 6 a.m. Friday, March 4 as ECUA performs underground utility work. Interstate 10 (I-10) over Eleven Mile Creek Bridge, Escambia County – East and westbound traffic reduced to one lane at the bridge as crews perform construction activities. U.S. 90 (Scenic Highway) at the intersection of Scenic Highway Circle, Escambia County – Emergency repair work continues. New stormwater pipe will be installed beneath Scenic Highway. Traffic flaggers will be on site to assist with traffic control as construction vehicles enter and exit the work area. I-10 Widening, Santa Rosa County – Alternating lane closures between the Escambia Bay Bridge and S.R. 281 (Avalon Boulevard/Exit 22) from 8 p.m. to 6 a.m. Sunday, Feb. 28 through Thursday, March 3 as crews perform construction activities. In addition, the southbound travel lanes on Avalon Boulevard near the I-10 interchange will be closed during this time. One lane of traffic will be open in each direction in the northbound lanes. The closures will allow crews to perform pile driving operations. The speed limit on I-10, between the Escambia Bay Bridge and Avalon Boulevard, is reduced to 60 mph. U.S. 90 Milton, Santa Rosa County- Alternating lane closures near the Marquis Bayou Bridge from 6:30 a.m. to 6 p.m. Saturday, Feb. 27.and Sunday, Feb. 28 and from 9 p.m. Monday, Feb. 29 to 6 a.m. Tuesday, March 1 as crews place the final layer of asphalt on roadway. U.S. 98, Santa Rosa County- Alternating lane closures from the Gulf Breeze Zoo to the Okaloosa County line 8 p.m. to 6 a.m. through the end of February as crews perform striping operations. U.S. 98, Santa Rosa County- Alternating lane closures between Central Parkway and the Gulf Breeze Zoo from 7 p.m. to 7 a.m. Sunday through Thursday as crews mill and pave crossovers and side streets. This work is anticipated to take place through Thursday, March 10. All activities are weather dependent and may be delayed or re-scheduled in the event of inclement weather. Motorists are reminded to use caution, especially at night, when traveling in a work zone and to watch for construction workers and equipment entering and exiting the roadway. 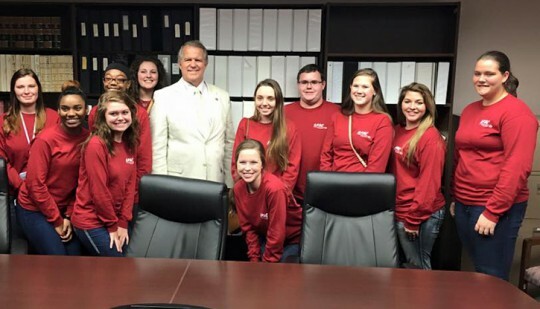 Escambia River Electric Cooperative Tallahassee Youth Tour delegates from Northview and Jay high school spend two days in Tallahassee getting an up close and personal look at government in action. Attending from Jay high School were Rebecca Boutwell, Destiny Herring, Madelynn Holt, Meghan Mayo, Megan Mulford, Krissa Olivieri and Dylan Wayland. 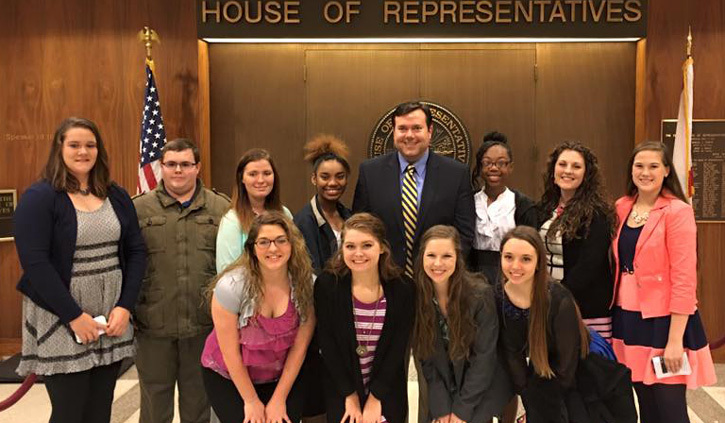 Attending from Northview High School were Zipporah Harris, Ziara Johnson, Daysha Kite and Brittanee Thomas. Allison Woodfin of Molino was recently crowned Miss Emerald Coast 2016 in Niceville. 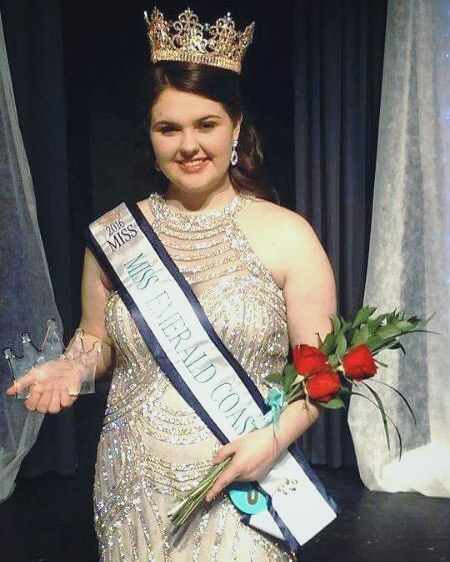 As Miss Emerald Coast, Woodfin will attend benefits Connecting Kids, and the ARC of the Emerald Coast, as well as Special Olympics events across the Emerald Coast. The pageant benefits Connecting Kids, which provides playground equipment for children with disabilities and works bridge the social gap between children with disabilities and their peers. Woodfin is a senior at West Florida High School. Lawmakers are considering a proposal that would use hundreds of millions of dollars in state money to hold local education property taxes steady, as House and Senate negotiators continued working toward an agreement on the budget. The proposal, floated by the House, would wipe out an increase in the “required local effort” that local school districts contribute to the state’s funding formula for public schools. The increase would have been driven by rising property values, not a hike in the millage rate, but critics have argued that it still would have been a de facto tax increase. 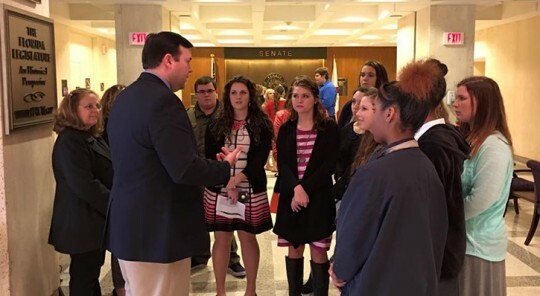 Sen. Don Gaetz, the Niceville Republican who chairs the Senate committee overseeing education spending, praised the plan that was offered by his House counterpart, Rep. Erik Fresen, R-Miami. “What the chairman and I have been talking about publicly and privately over these weeks is finding some kind of alternative, so that the state could buy down a greater share of that increase, and so that at a time when we want our economy to continue to thrive and grow, that we don’t provide a broad-based property tax increase on the backs of the people of Florida,” Gaetz told reporters after a meeting with Fresen. While the House proposal includes the largest per-student funding amount in state history — at $7,178.49 a head — it would provide less per student than the budgets approved by the House and Senate, as well as the spending plan recommended by Gov. Rick Scott. The two sides were expected to meet again Saturday night, but Gaetz has been vocal on the issue of local property taxes, making it likely that the offer or something similar would be accepted. Elsewhere in the Capitol, smaller deals were struck as both sides looked to finish work on a budget for the year that begins July 1. Lawmakers agreed on funding for smaller or non-controversial agencies like the Florida Lottery and the Office of Insurance Regulation. A negotiating committee dealing with economic development and related issues finished work on the spending plans for the Department of Transportation and the Department of Highway Safety and Motor Vehicles. Lawmakers there were still slogging through work on dozens of parochial projects late Saturday evening. 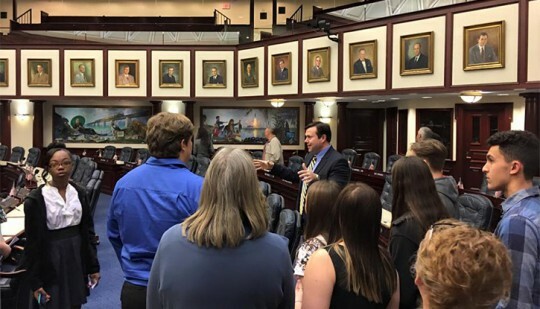 And Sen. Jack Latvala, a Clearwater Republican heading up those negotiations for his chamber, also expressed disappointment with the decision by legislative leaders to refuse to fund an economic incentive program touted by Scott. Scott had pushed for $250 million for a “Florida Enterprise Fund” that would overhaul state incentive funding and help him attract businesses to the state. Senate leaders had backed the request, then dropped it to reach a deal with the House on the broad outlines of a budget and move to the current stage of the negotiations. Rep. Clay Ingram, the Pensacola Republican working with Latvala, told reporters that the House wasn’t interested in reopening the issue. 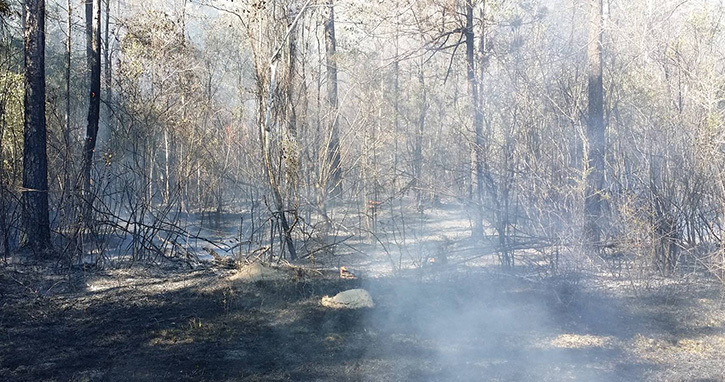 Firefighters battled a large brush fire off Highway 97 near Dogwood Park Sunday afternoon. 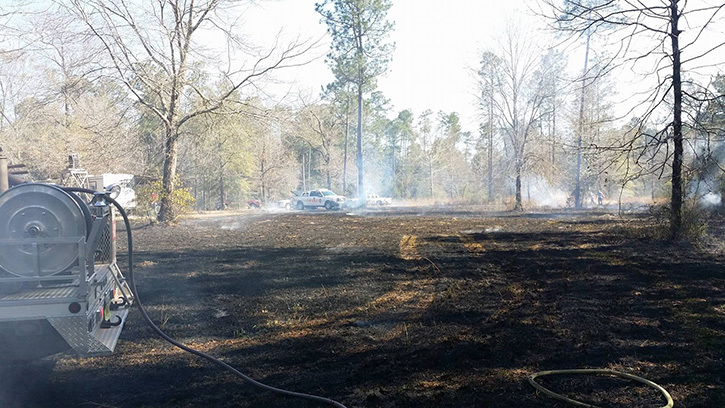 The fire off Parker Lane, near Hendricks Lane, consumed a large grassy area and moved into a wooded area. Firefighters from the Molino, McDavid, Walnut Hill and Cantonment stations of Escambia Fire Rescue and the Florida Division of Forestry battled the blaze with two bulldozers. The fire destroyed a tractor and a SUV. There was no immediate word of a threat to any structures and no injuries reported.